Feel like you're struggling with WHAT to post on your Social media/Blog?youtube? Feel like you DON'T relate to some of the people you are trying to help? Back in 2012, I discovered the most amazing woman on the planet! My mentor (from afar) and BUSINESS GURU extraordinaire: Marie Forleo! (www.marieforleo.com). I signed up for her B-School and she taught us this AMAZING exercise: Creating your "Ideal Customer Avatar"
I don't want anyone to let this training pass them by! DO IT! You'll attract people you don't relate to & coaching isn't as fun. It feels like an uphill battle. I, for example, don't relate to MEN who are trying to put on muscle. I would much rather work with a 25 yr old woman!! 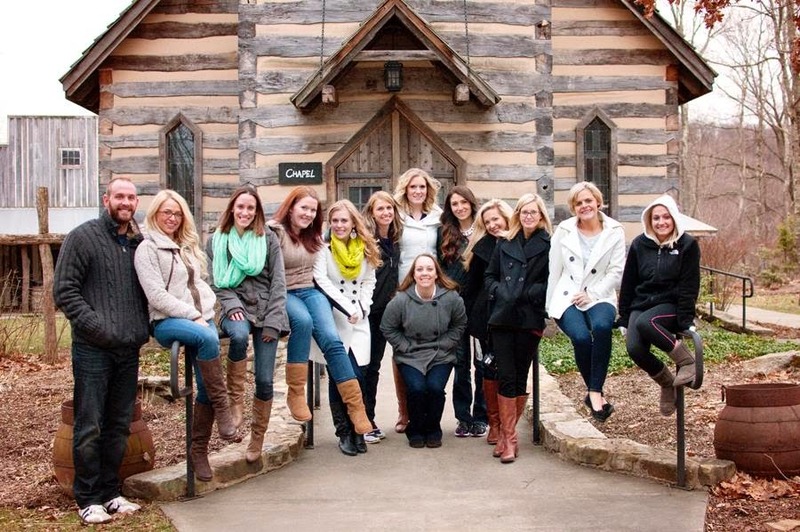 Once you identify your Brand, marketing becomes SO much easier & fun! You'll attract customers who are perfect for you! You'll form a deeper & more meaningful connection with your customer & team! When your customers feel that YOU understand them, you establish a deep level of trust. Deep trust = repeat customers. Happy customers = a successful LONG TERM business! This exercise CHANGED MY BUSINESS....I went from having a wide variety of people...to narrowing my focus and attracting coaches who are just like me. It makes your job as a coach a lot easier, a lot more fun and gives you purpose because you know who you are trying to help! STEP 1 First, you want to make a list of characteristics that represent the person you MOST enjoy helping! Who are they? What do they like? What do they do for fun? PRO TIP: Really dig deep on this! What does she fear? What are her goals? What keeps her up at night? Put yourself in their shoes! My customer is worried about signing up as a coach and putting their SSN # on the website. What if this is a scam!?!? Knowing this helps me explain things and ease their mind. Think back to what you felt or thought about Beachbody before you were a coach or really understood it. STEP 2 Create a VISUAL! Something you can re-visit and read when you need inspiration or focus! Check out my picture! This represents MY Brand and my Ideal Customer/Coach. I've named her Kaitlyn. "Kaitlyn" LOVES the beach, she's super carefree but then stresses about random things, she likes to research before she purchases but then ends up making impulse buys based on her gut, she loves ordering things online. She is an animal lover and would rescue every dog if she could. She reads People magazine but loves personal development as well. She bites her nails unless she has a manicure & hates scary movies. She's never been "Fat" but wants to tone and lose 5-10lbs. PRO TIP: Your visual should really speak to you and inspire you! You might discover that your ideal customer is YOU! It's easier to talk to and help someone that you relate to! After reading your slide, you should be EXCITED to help this person! STEP 3 Revisit this daily! Save your image on your desktop if it helps. I know so much about my Ideal customer "Kaitlyn" I could go on & on her. This person is someone I made up...but by creating her identity and relating to her....I get ideas for what I should post. I think about "What would Kaitlyn be inspired by? What worries does Kaitlyn have?" This should inspire you! You should have pages of ideas for your website, blog, and Facebook on what you can do to help this person. You should be able to create content that will not only appeal to them but makes them feel like "Wow! she really gets me!" 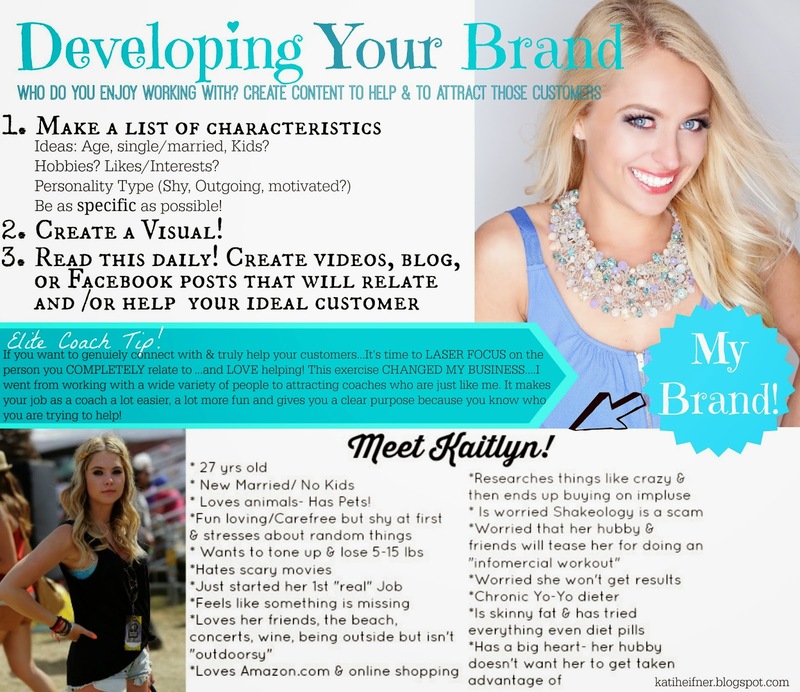 I'm able to create CONSISTENT marketing and a consistent message that ATTRACTS girls just like "Kaitlyn" into my business. Building a connection is KEY in getting people to contact you! Think about what kind of VALUE you can add to this person's life. What can you give? What advice or guidance can you provide? "If you want to hit the bullseye, throw more darts" Creating content that builds your brand is a process that takes time and consistency! MOST of this applies to the future COACH you are going to attract, but I like to take it one step further. 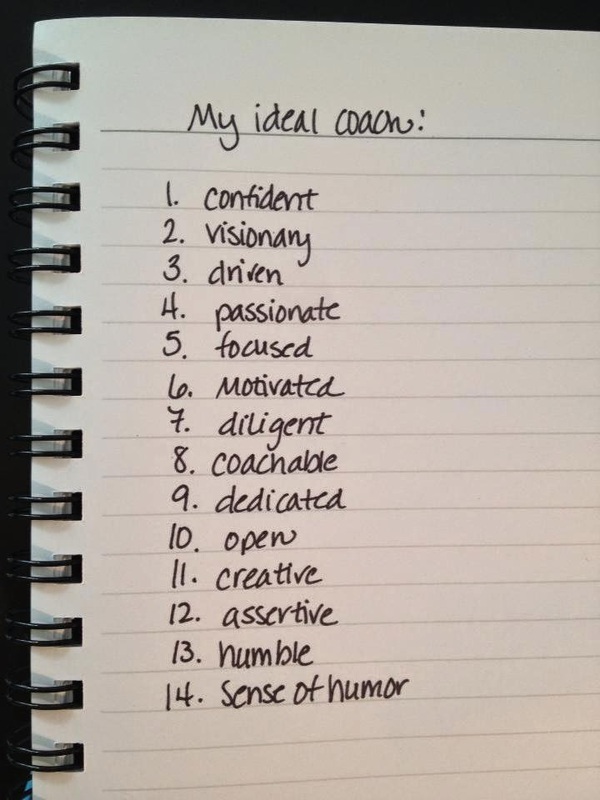 Make a list of the characteristics of your IDEAL COACH. If you want to attract that type of person into your business, YOU need to be the BEST example! Lead from the front! Your list is basically what your "ideal coach" is looking for in a sponsor! Look at your list...what do you need to work on? Create your personal development strategy around your areas of opportunity. Pittsburgh Super Saturday with my team! So there you have it...if you want to create a consistent message, REALLY connect with your customers and truly help them....you FIRST have to figure out who it is that you want to help! This post really gave me actions that I can take to create relevant content that makes sense for my target audience. Thank you for writing this! Thank you for sharing this Kati. You are awesome! Hey There! Great blog post on branding! I am a student of Sales & Marketing right now and working with some fantastic Mentors who are teaching me a lot about my ideal client which you got it, is me! Have had B-School on my radar heard nothing but great things about it! I have to thank you for the efforts you have put in penning this website. I am hoping to view the same high-grade content by you in the future as well. In fact, your creative writing abilities has motivated me to get my very own site now. I read your blog. you share all kind of information is so informative.thanks for your information. Just read this because of our "Rank in the Bank" training session. Soooo very helpful!! Thank you!! Very useful and helpful information!! !